Smaller double en-suite but perfectly formed and located on the 2nd loft floor (some sloping ceilings). Cosy Double sometimes limits bookings to 2 or more days. Two separate rooms (1 double room and 1 single room sharing a shower en-suite between the rooms) occupying entire 2nd attic floor (some sloping ceilings over beds). Pocket sprung standard sized double and single beds with quality cotton bedding, free Wi-Fi internet, complimentary luxury toiletries and towels. Beverage tray and mini fridge in double room for guests use. TV in both rooms. Comfortable chairs also provided. Max 3 persons. 1 car parking space only for this unit. Double & Single sometimes limits bookings to 2 or more days. 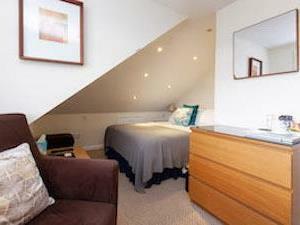 Standard ground floor double room with en-suite shower, digital tv, free Wifi and mini fridge.